We hardly ever eat out—once a month, maybe. But when we do, my first thoughts always seem to be either orange chicken or a crispy fish sandwich. Not surprisingly, both dishes have a fried component, which is something I don’t do very often at home. And I swear that every time I see somebody making fish tacos on the Food Network, my mouth instantly starts watering. So yesterday we finally renewed our Costco membership and Jeremy brought home some much-needed groceries, including, to my surprise, some non-salmon fish. 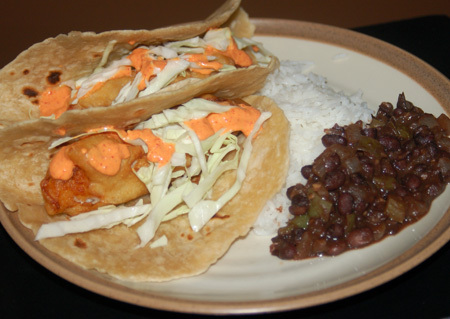 Much as I like salmon, the sight of rockfish was a welcome change of pace, and I immediately started thinking fish tacos with homemade tortillas, shredded cabbage, and a little drizzle of creamy sauce, perched alongside a plate of rice and fragrant black beans. Since the batter needs to rest, this recipe calls for some advance preparation; I used the down-time to make tortillas and prepare the other accompaniments. I know that corn tortillas are more traditional, but Jeremy strongly prefers my wheat ones and I’d have to agree for the most part. By the time the last one was stashed away in a towel for insulation, the rice cooker was counting down, and the beans were bubbling away. My batter was not the most cooperative. Somehow I read the recipe as “the consistency of thick pancake batter” when it was actually “the consistency of thick paint,” which makes a heck of a lot more sense. Anyway, the beaten egg white helped a little, but the end result was still closer to spaetzle batter than a fish coating, and it kept wanting to pull off the fish as I dipped it. I was able to work around this issue, however, and miraculously, once fried, the batter didn’t seem too thick or grease-absorbent, which I had feared. The finished tacos were served up with shredded cabbage and a drizzle of roasted red pepper sauce leftover from those salmon croquettes. They were fantastic: Jeremy somehow found room to eat four tacos in one sitting, and has already been commenting on how I should make them again. To round out the meal, I made rice and beans. In reaching automatically for the bag of pintos, I caught myself and decided to change things up by using black beans instead. I love the look of them, and since I was searching for ways to use a batch of thick blackberry compote (more on that, and other uses for wild blackberries, can be found here), I thought that they would play nicely together, colorwise and flavorwise. The compote added a subtle sweetness that worked in concert with the sweet peppers and onion and in contrast to the smoky heat of chipotle and the zing of cider vinegar. In a saucepan or skillet, heat the olive oil and saute the onion, green pepper, and garlic in it until tender. Add the beans, blackberry compote, cider vinegar and salt to taste. Depending on the density of your blackberry compote, you may want to add a bit of water or reserved cooking liquid from the beans. Update 11/23/10: Jeremy’s eyes lit up when I suggested making fish tacos with the catfish we had on hand. This time I based my dredge on this one from Emeril, and it all turned out great. Of course I made my roasted red pepper sauce to drizzle over the fish, and since we had some Chinese cabbage on hand, I dressed it lightly with a basic vinaigrette: lime juice and olive oil, plus a pinch of salt and a tiny squirt of agave to balance the lime. The catfish was really moist and juicy—I anticipate a lot of fish tacos in our future now that salmon season is long gone. Update 8/9/11: I tried a new batter to make tilapia fish tacos this week, and it turned out so nicely that I anticipate using this version for all my fried fish from now on, in or out of tacos! I halved this recipe and still probably could have battered 6 fillets of tilapia, so I might cut it back even further next time, or else have some onion rings ready to fry up too! I did have to add quite a bit of extra sparkling water to the batter to get it to a proper consistency for dipping; next time I make it, I will try to measure it out. I shallow-fried in olive oil and ended up with juicy fish and a crispy, flavorful coating that didn’t fall off. Update 9/30/11: Quartered the masa batter above to make tacos just for me and my dad, and still had enough batter leftover to do some onion rings as well; they tasted great, but the batter didn’t stay on them quite as well as on the fish, so maybe a dredging in flour would help. 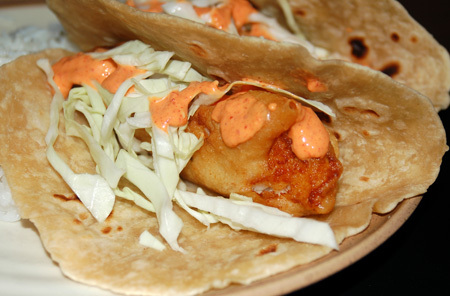 I never had fish tacos before…I will have to try this!! Thank you for this recipe my wife will love me when i bring this home. OK, very intrigued by the blackBERRY beans! I will have to explore that recipe for sure.! Friday Delights and Manly Housewife, please do try the fish tacos! But beware, they are addictive… I have already made them a second time since this post. Evelyne, the beans were great. That little hit of blackberry really adds depth, but I suspect that other fruit butters would work well also.